Should You Take a Tax Extension or Not? I’ve taken a tax extension for our personal taxes and business taxes for several years. I’m not normally a procrastinator. Actually, I usually beat my work deadlines. So what’s up with the tax extension? Should I take a tax extension? Here’s my situation, each year we have at least 4-5 returns to oversee. Some I do on my own, others I pass on to our accountant. But even if you hire an accountant, it’s almost as difficult as completing the taxes on your own with a tax preparation program, if you have a complex financial situation. You still need to compile all the records, organize them into a legible format and then review the completed returns with a fine tooth comb when they’re complete. So here were my thoughts when I wondered, ‘Should I take a tax extension?’ I felt like I was busier in the spring than the summer. Sometimes my spouse and I had travel commitments in the spring. The summer just seemed more leisurely to me. So this year, I’ve put the tax filing decision off so long that even if I wanted to get our taxes in by April 18th, my accountant couldn’t meet the deadline. So, if you’re reading this article now, you’re probably on your way to taking an extension. Skim the article and don’t worry if you decide to take a tax extension this year. Lack the proper documentation-Did you lose or misplace your W-2 or other important tax forms? Then you might want to take an extension so that you have the filing documentation. Life happens-Maybe you had a baby, a robbery, unexpected stress or other life event that makes now very busy. You’re entitled to take the extension, so you might reduce stress by filing the IRS form 4868. Your accountant is too busy now-If you’re depending on an accountant to complete your 1040, then she probably can’t fit you in the week before the deadline. So, take an extension. You don’t need a reason-The IRS doesn’t require a reason, just a form. So if you want more time to file, just pay the amount of tax due and complete the paperwork later. Anyone can file form 4868 and request a six-month extension to file their taxes. For convenience, you can complete the form online. This does not give you an extension to pay your taxes. If you haven’t paid the amount owed by April 18th you’ll owe interest on the balance due and maybe penalties as well. Filing for an extension circumvents the ‘late fee’ of 5% per month due on late filed tax returns. What if you don’t have the money you owe by April 18th? An extension isn’t going to help you with this problem. If you’re struggling to pay your taxes, the IRS has a handy guide to help. Whatever you do, don’t avoid taking action to resolve the problem, it won’t go away. Whatever you do, don’t avoid taking action to resolve the problem, it won’t go away. If you’re self-employed and have already set up a solo 401k or simple-IRA, filing an extension gives you an extra 6 months to fund these retirement plans. Entrepreneurs can set up and fund a SEP-IRA for the prior year during the extension period. This extension to fund opportunity doesn’t apply to Roth or traditional IRA’s. Filing an extension may be helpful if you’re uncertain whether you’re eligible for a specific type of IRA. As long as you’ve funded the IRA by the April deadline, the extension allows you extra time to turn a traditional IRA into a Roth or vice versa. You may even recharacterize a Roth conversion back to a traditional IRA during the 6 month extension period. An extension buys you time to make decisions. For the business owner, the extension gives you an additional 6 months to determine whether to depreciate equipment or take a Section 179 deduction as well as whether to carry back or forward any business losses. Be aware that you may not be eligible to file for a tax extension if you’ve been approved for an offer in compromise. In that circumstance, you need to file by the April deadline during your five-year probationary period. If you fail to file in April, then you risk losing your offer in compromise. Finally, taking an extension can give you more time to review your tax situation and avoid mistakes. Your accountant may be more relaxed if you take an extension. I think my accountant prefers it when we take an extension. No one can answer the question, ‘Should I take a tax extension or rush to file?’ but if you’re strapped for time right now, and pay the full amount you owe, then you may want to consider filing a tax extension. On the other hand, if you only have W-2 income and a small amount of investment income, then it’s quick and easy to use financial software or a free program to file your taxes now. Thanks for the informative blog! I didn’t understand all those things before. You explained them clearly. I appreciate that! 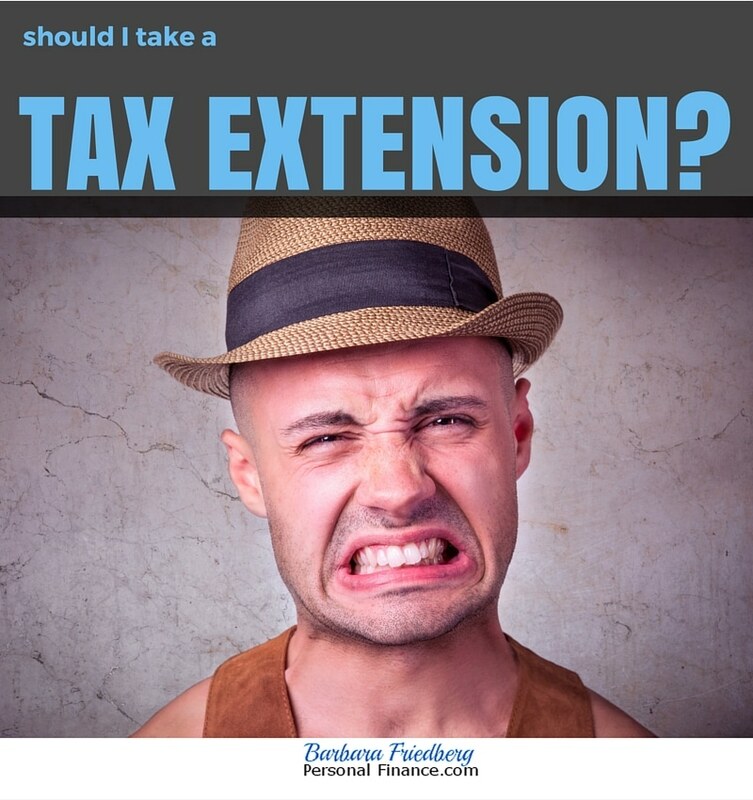 It seems like getting an extension will cost you if you are going to owe. Figuring out what you owe is time-consuming, you might as well file. If you under guesstimate, there are penalties. If you overestimate, to be safe and avoid penalties, how are you going to get the excess back? What am I missing here? Cathy, If you overpay, you’ll get a refund back after you file. But you are correct that for some easier returns, you’re probably better off just filing. Once you calculate how much you’ll owe, you’re likely almost done completing your taxes.